LOUNGE 13' 1" x 12' 0" (3.99m x 3.68m) With a front facing UPVC double glazed sash window and timber and glazed entrance door. Ceramic tiled floor. KITCHEN DINER 15' 4" x 8' 3" (4.68m x 2.53m) Fitted with a range of wall and base cupboards, laminate work surfaces and stainless steel sink and drainer. Built in gas hob and electric oven. Space for washing machine. Tiled floor. Door to rear lobby. LOBBY With staircase to the first floor. 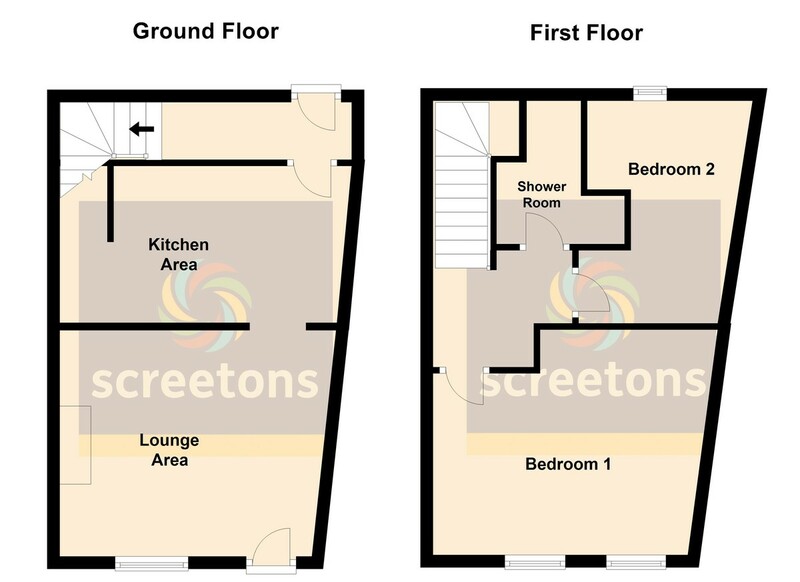 LANDING Access to two bedrooms and shower room. BEDROOM ONE 13' 3" x 11' 10" (4.06m x 3.61m) Front facing UPVC double glazed sash window. BEDROOM TWO 11' 0" x 8' 8" (3.37m x 2.66m) Rear facing single glazed window. SHOWER ROOM Fitted with a shower cubicle with mains shower and white w.c and wash hand basin.